The CPM-1600-2-CM Console Server + PDU Manager is a comprehensive Out-of-Band Rescue Solution, which includes all the remote network management tools you need in a single package. When routers, switches and other vital network elements at distant equipment sites become unresponsive, the CPM-1600-2-CM provides NOC personnel with a quick, secure, reliable means to access console port command functions and 240V AC power reboot capabilities at remote sites in order to quickly restore normal operation without the need for a physical service call or truck roll. In addition to providing remote access to power control and console port command functions, the CPM-1600-2-CM also includes a versatile assortment of user-configurable monitoring and alarm functions. When high rack temperatures, unresponsive devices, power supply irregularities and other signs of potential trouble are detected, the CPM-1600-2-CM can provide immediate notification via email, text message or SNMP trap. In order to provide an audit trail for network administrators, all alarm events, (as well as user activity,) can also be logged for later review. When a vital network element at a remote site malfunctions, ceases to respond and disrupts network communication, the remote console port access provided by the CPM-1600-2-CM allows personnel at your centralized NOC to correct the problem without the need to travel to the site in person. In cases like this techs can establish an out-of-band connection to console ports on problematic devices at remote sites in order to reload routing tables, change configuration parameters or initiate diagnostic/troubleshooting routines. 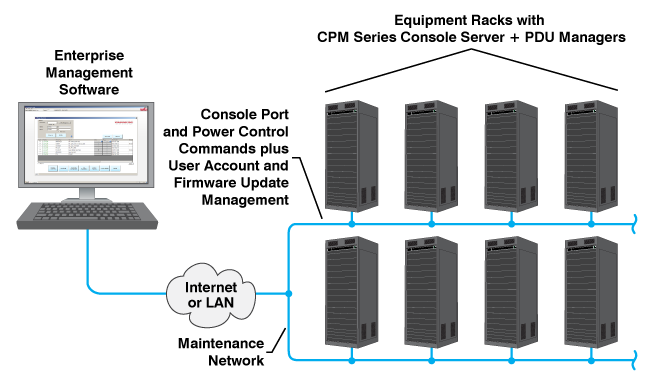 When console ports on devices such as servers, routers and firewalls are connected to the CPM-1600-2-CM, remote administrators can individually access each console port by number, name or port group via SSH or Telnet session. The CPM-1600-2-CM also simplifies the process of connecting with a specific port by allowing direct connection, using TCP port assignments. In addition to providing remote, out-of-band access to console ports, the CPM-1600-2-CM also allows administrators to create connections between console ports. Full matrix capability allows two ports to be easily connected, even when ports are configured for different communication settings. It’s no secret that a power reboot is often the most effective way to revive an unresponsive network element. Although a power reboot is a simple proposition when the device in question is located across the room or down the hall, rebooting an unresponsive device can prove to be a much more difficult challenge if the device is located at a remote, inaccessible site. The CPM-1600-2-CM streamlines the process of rebooting remote network elements by providing a secure, reliable means to control reboot functions at remote sites via an out-of-band connection. When a CPM-1600-2-CM is installed at a remote site, NOC personnel can communicate with the CPM via network or out-of-band and initiate power reboots or control power switching functions remotely, without leaving the office. When rack temperatures or current usage at the remote site exceed acceptable levels, the CPM can also be used to switch off power to nonessential devices in order to conserve power, or switch on cooling systems or other equipment to lower rack temperature. The CPM-1600-2-CM includes a powerful array of security, authentication and encryption functions to prevent unauthorized access to sensitive power control and console management functions. A multi-level user directory allows administrators to set unique passwords, usernames and access privileges for each user account. An address-specific IP security mask allows administrators to limit IP access to specific, user-defined IP addresses or ban entire IP address ranges from accessing the unit. Support for popular third party authentication protocols, such as LDAP, Kerberos, TACACS+ and RADIUS verify the identity of each potential user. Secure Shell (SSHv2,) SSL/TLS and an embedded FIPS 140-2 cryptographic module help to ensure that data and commands sent to and from the CPM-1600-2-CM are safely protected from unauthorized interception. In order to provide compatibility with GigE Networks, the CPM-1600-2-CM includes a 10/100/1000Base-T Ethernet port. The Gigabit Ethernet port can be connected directly to your network, or connected to a satellite modem or cellular router to provide additional means for out-of-band communication with the CPM. This feature can prove particularly useful for providing OOB communication with the CPM in situations where equipment is located at remote, inaccessible locations, beyond the reach of a network cable. An internal 56K, v.92 dial-up modem provides an additional avenue for out of band communication with the CPM-1600-2-CM. This can prove very useful in both cases where a secondary network connection is unavailable and in applications that require an additional means for out-of-band access, beyond network communication. In order to authenticate dial-up users before access is allowed, the CPM also includes a dialback security function. The dialback security function allows administrators to define a dialback number for each user. When users attempt to gain access via dial-up connection, the CPM will first prompt the user to enter an account name and password. If a valid username/password is entered, the CPM will then disconnect and call the user back at the dialback number that is defined for that account. The CPM-1600-2-CM also current monitoring capabilities, allowing you to monitor current consumption at each switched outlet. Current consumption data can either be logged for future review or downloaded as it is generated to provide remote administrators with a clear picture of current needs at far away equipment sites. If desired, the CPM-1600-2-CM’s current alarm function can provide instant notification via SNMP trap, email or text message when consumption levels exceed user-defined trigger levels. In addition, the current consumption alarm can also be configured to automatically switch off nonessential devices when current consumption rises over acceptable levels, and then automatically switch those devices back on when consumption returns to normal levels. In addition to providing a means for remote console port access, the CPM-1600-2-CM can also be used to collect data from attached devices. When CPM serial ports are set for Buffer Mode, this allows the collection of incoming data, such as error messages and status alerts from attached devices. Once stored in CPM memory, this data can be viewed, saved, erased or sent out to another location via SYSLOG. If desired, an SNMP message can be automatically generated to alert administrators that new console messages have been received. The CPM-1600-2-CM includes four power inlets, with each inlet supplying current to four switched outlets. This presence of four power inlets combined with split power bus architecture provides higher amperage to each switched outlet than would be possible with only one power inlet, allowing the CPM-1600-2-CM to be used with high amp devices such as larger routers and switches. 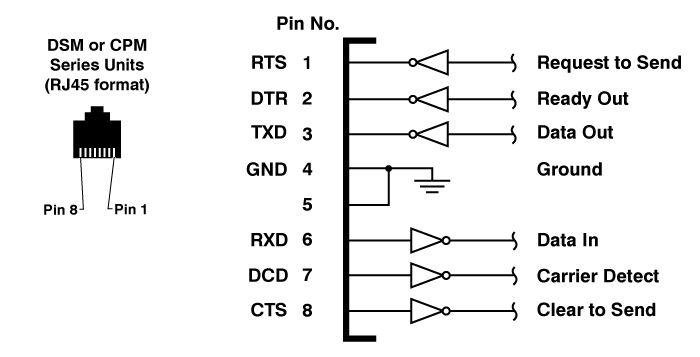 The split bus configuration also enables isolation of power supplies. In the event that one power source fails and the four connected outlets are deprived of power, the remaining outlets will still be powered, providing that the power is still available at the inlets that supply those outlets.